You would have to have been on a Valium-induced holiday to Antarctica not to have heard about Angels in America at the NT. War Horse director Marianne Elliott’s production of Tony Kushner’s two-part epic is perhaps the most anticipated opening of 2017, boasting an irresistible combination of legendary text and star-studded cast. Kushner’s two plays – Millennium Approaches and Perestroika – received their UK premieres at the National in 1992/1993, Declan Donnellan’s productions stamping themselves in theatrical folklore as a towering high-point in the theatre’s history. Set in 1985 and dubbed “a gay fantasia on national themes” by Kushner, Angels In America concerns a group of interconnected New Yorkers struggling to cope with both the AIDS epidemic and the cut-throat capitalism of Reaganomics. But that summary doesn’t quite do justice to a sprawling, multi-faceted eight-hour story that liberally blends reality and fantasy, travelling from New York, to Salt Lake City, to the South Pole, and to heaven in the process. In the early 90s, Kushner’s plays were a revelation – a frank, unapologetic, gloriously anarchic look at New York’s gay community, loves, lives, lesions and all. Twenty-five years later, do they still have the same earth-shattering effect? For Mark Shenton (The Stage, ★★★★), Millennium Approaches and Perestroika still work because they refuse to submit to traditional playwriting formulae, playing with form throughout. “Conventional scenes of domestic realism throw off those shackles with abandon to enter hallucinatory realms of fantasy, mystery and mysticism,” he explains. Andrzej Lukowski (Time Out, ★★★★) concurs. For him, this “enormously long, enormously arch, symbol-drenched magical realist epic” still works because “its doomy, sardonic surrealism remains quite unlike almost anything else”. “There is a constant WTF factor,” he admits. Most, though, have only praise for Kushner’s work, Marianka Swain (Broadway World, ★★★★★) calling it both “an evocative history play” and “a powerful call to arms”, Sarah Crompton (WhatsOnStage, ★★★★★) extolling it as “a vibrant hymn to the ragged soul of humanity itself, in all its messy, complicated imperfection”, and Sam Marlowe (Chicago Tribune) revelling in “eight hours of rich, provocative, thrilling theatre”. Elliot’s revival has a cast most productions can only dream of. Oscar-nominated Andrew Garfield heads the bill as Prior Wilson, an eloquent, erudite 30 year-old stricken down by Aids and haunted by hallucinations. Alongside him are James McCardle as the agonisingly liberal Louis, Russell Tovey as still-in-the-closet Mormon lawyer Joe, Denise Gough as Joe’s pill-popping, day-dreaming wife, and Broadway stalwart Nathan Lane as corrupt kingpin Roy Cohn, the “polestar of human evil”. He is “droll, effete and fabulous” according to Swain, “vulnerable and heart-rendingly eloquent” according to Hitchings, and “crushingly powerful” according to Dom O’Hanlan (London Theatre, ★★★★★). There are similarly lavish write-ups for his co-stars. “McArdle has a lovely natural authority as treacherous office worker Louis, who’s charismatic even when wallowing in self-pity,” claims Hitchings, while Libby Purves (TheatreCat, ★★★★) lauds Tovey as “restrainedly moving in his pious, panicked denial”. Cavendish heaps praise on the “superb” Lane, who’s “puppyish one minute, a rottweiler the next, finally pained and emaciated”, and Matt Wolf (the Arts Desk, ★★★★★) is similarly admiring of the “rivetingly dreamy” Gough. “The entire cast are just superb,” sums up Crompton, and it’s only Brantley that disagrees, reckoning that McArdle and Gough “aren’t quite on the same playing field” as Garfield and Lane. 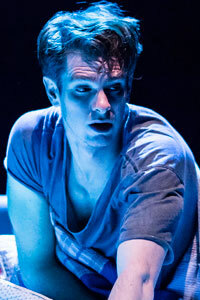 Angels in America – Heaven on Earth? Kushner’s work still strikes a powerful chord then, and this revival’s cast of notables more than earns its star-billing, but what about Elliott’s direction, and Ian MacNeil’s set? Do they make sense of Kushner’s fantasia? Most critics think they do. For Hemming, Elliott’s production is “impressively fluent”, for Brantley it’s decorated with “impressive visual touches”, and for O’Hanlan it’s “richly spiritual and wholeheartedly triumphant”. Elliot’s staging “rises inventively to its flamboyant challenges, with a little sci-fi, a little homespun rough magic and a lot of high camp,” says Marlowe. There’s less consensus over MacNeil’s set, which evolves from a twisting, neon-lit New York into a sparse dreamscape of twisted metal and barely furnished rooms, that reaches the full depth of the Lyttelton stage. For Shenton, it’s a design that “slides effortlessly between realistic and fantasy worlds”, supplying “constant surprises of its own”, but for Cavendish, “there’s not quite enough TNT in the visuals”. “There’s an air of ‘will this do? '” he remarks. The majority side with Cavendish, Wolf observing that “the forbidding visuals lend a cramped and brutalist feel to the turntable-drive first play, and only give the barest sense of time and place in the second”. 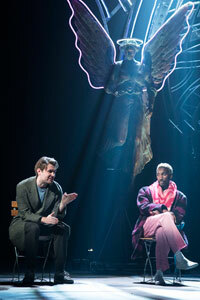 Angels in America – Is it any good? 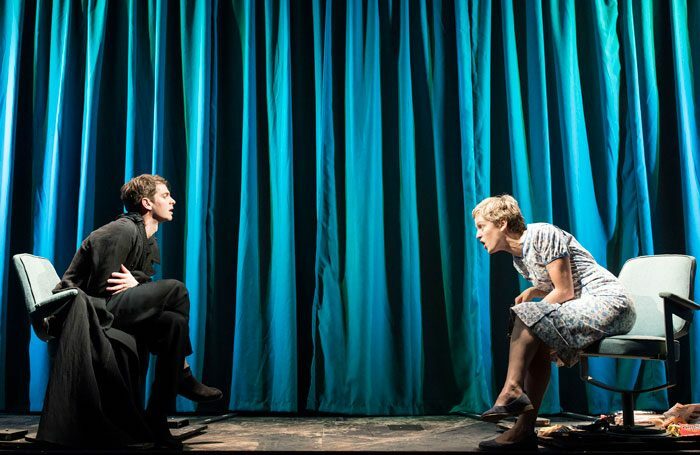 For some, Elliott’s revival of Kushner’s classic double-bill is nothing short of a triumph. 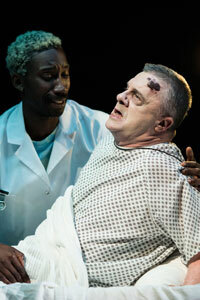 It earned five-star reviews from the Evening Standard, the Telegraph, WhatsOnStage and the Arts Desk, and more. For others, though, it’s not quite the smash-hit sensation it’s billed to be. Four-star reviews in the Guardian, The Stage, the FT and Time Out (and a two-star in the Times) nod towards a staging that’s still excellent, but not perhaps as revelatory as it was the first time round. Kushner’s play remains a sprawling mishmash of politics, religion, theology and hallucination, though, and Garfield turns in an award-worthy exceptional performance too. Elliott’s production might have aimed for the stars and just missed, but it’s still landed pretty close to heaven.